Editor’s Note: This pattern is no longer available for free. It is now available for purchase here. 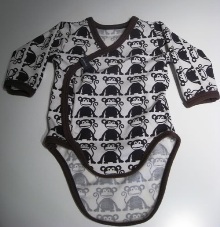 Nefertari shares a free pattern and tutorial for making this wrap-around onesie. The onesie is shaped so that you don’t have to pull anything over baby’s head. I wish we had these when my girl was a baby! The pattern is a European size 62, which I believe corresponds roughly with a 3-6 month size. If you wanted to make a larger or smaller wrap-around onesie, I’m sure you could adjust the size using one of your child’s onesies as a guide. Go to the free pattern and tutorial. Size 62 means it will fit a baby about 62 centimetres long. It is roughly 24 inches or 2 feet. Here it’s considered a size that fits 1-3 month old babies, though if going by how American “month-sized” clothes fit my girl it seems the babies and kids are way shorter in the upper body there! 62 means 1-3 month yes! Looks like I’m too late – the pattern is not available anymore on the links. Is there any other way to find it? Could you fix the link again, please? I like the look and simplicity of this onsie and would love to make some! Thank you! Broken again – says Page not found.